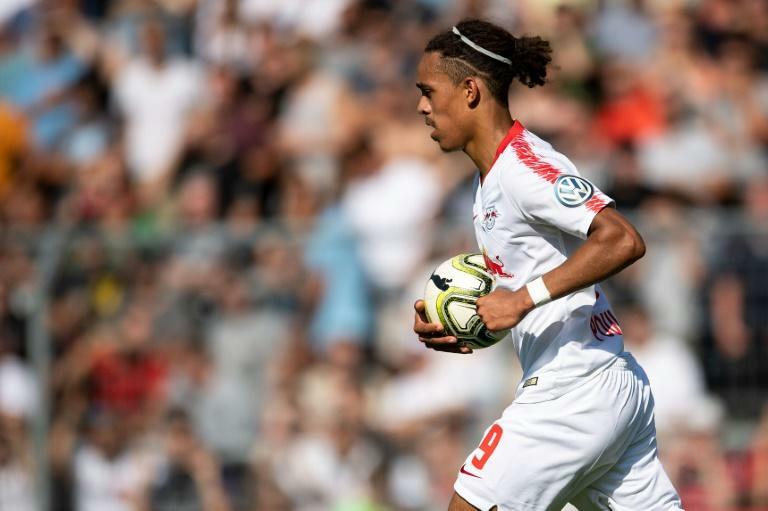 Yussuf Poulsen and Emil Forsberg dug jaded ten-man RB Leipzig out of trouble on Sunday as they came from behind to beat minnows Viktoria Cologne 3-1 away in the German Cup. Bundesliga side Leipzig were 1-0 down at the break at the fourth tier Cologne-based club after winger Timm Golley gave the hosts a shock lead in front of a crowd of 4,712. But Leipzig's Scandinavian stars turned the game as Danish forward Poulsen equalised on 60 minutes before Swedish playmaker Forsberg scored the go ahead goal with 21 minutes to go. Leipzig's substitute left-back Marcelo Saracchi was sent off 23 minutes from time for a last man foul, but French striker Jean-Kevin Augustin sealed the win by netting the visitors' third goal in added time. "We definitely didn't bring our 'A' game in the first half. After the break, we played with a lot more pace," admitted goal-scorer Forsberg. "All in all, it was a tough game. "Viktoria fought well and didn't make it easy for us." Leipzig's laboured display was understandable given their horrendous fixture list over the last three weeks. This was their fifth competitive match of the young after two rounds of home-and-away Europa League qualifiers. They have another European tie against Ukraine's Sorja Luhansk on Thursday before their opening Bundesliga game of the season at Borussia Dortmund on Sunday. In other first-round cup fixtures, second division Cologne ran riot in the capital as they hammered fourth tier team Dynamo Berlin 9-1 with striker Simon Terodde scoring four goals at Berlin's Olympic Stadium. On Saturday, holders Eintracht Frankfurt, who beat Bayern 3-1 in last season's final, crashed out in the first round with a 2-1 defeat at fourth-division Ulm. And mighty Bayern Munich needed a late Robert Lewandowski goal to secure a 1-0 German Cup win at Drochtersen/Assel, a fourth division village side who had a car salesman, tax advisor and stonemason in their team.